The Legrope is a surfboard accessory, however its widespread adoption from 1974 to 1977 had a huge impact on surfboard design, principally by removing commercial barriers to lightweight construction. 1. Progressive manoeuvres and a more aggressive technique could be adopted without paying the penalty of a swim to the beach. 3. Board destroying rock breaks were ridden without a financial/board repair penalty. 4. Despite an intial resistance to use in large surf, it could be argued that over time surfers were became more confident in larger waves with the assistance of the legrope. 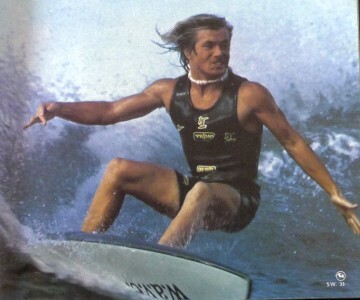 It's contribution to the upsurge of surfing performance in this period (as typified by Rabbit Batholomew's Breaking Down the Door article, circa 1976) was not noted by the major contributors (unlike their board designs) and is rarely acknowledged by journalists and historians. Brad Mayes, board and legrope, Bondi, 1974. Tracks #46 July 1974, page 10.
circa 1970 - Originally a hand leash fixed to the nose (Control Products USA), it was rapidly adopted as a rope and strap (commonly a sock or handkerchief ) tied to a hole in the fin. 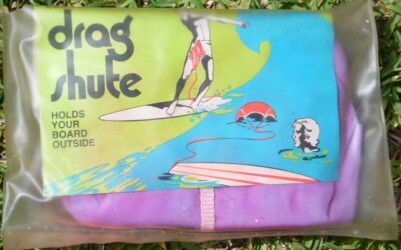 By 1974 commercial models of rope/latex tubing and velcro strap were widely available, however manufacturers were slow to fit legrope plugs to new boards until legrope use was accepted in professional contests. In the mid 1980’s rope/latex tubing was replaced by moulded urethane. Breakway, August 1974: Legropes-3 alternatives. Tony Edwards: Captain Goodvibes . 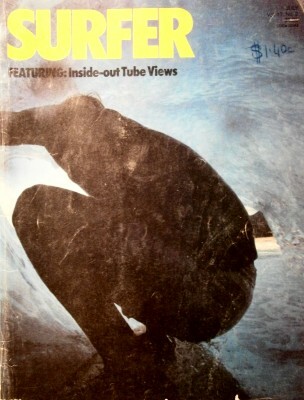 Surfing World Volume 17 Number 4 1974? The Wedge at Newport, photography by Alan Rich. Bob Cooper Surfboards, Coffs Harbour. Fred Pyke Surfboards, Hot Buttered Surfboards, Nalu Surfboards, Golden Breed, O'Neill. Cover: Australian Titles to Peterson. Movies: Drouyn and Friends, Rolling Home, Red Hot Blue. Surfcords by Surf Aids, Byron Bay. Film Review: On any morning. Morey – Doyle a soft foam board designed by Tom Morey and Mike Doyle (both USA) incorporating Greenough flex principles and circumventing fibreglass boards beach restrictions. Question: Did the first model come with a wrist leash? 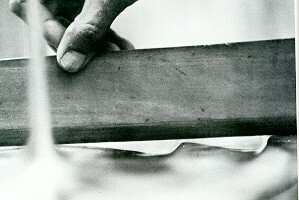 Morey Boogie Flexible foam bellyboard invented by Tom Morey as an offshoot of his experimentation leading to the Morey-Doyle flexible surfboard. Based on the Hawaiian paipo and incorporating flex and ‘vacuum track rails’ (Greenough / Brock hull design). The soft construction circumvented bodysurfing area restrictions. Originally offered as a buyer assembled mail order product. 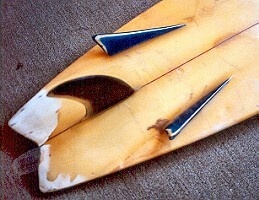 Bonzer Original design by Campbell Bros. (USA) in 1973, features tri fin setup with long base keel side fins combined with single to double concaves bottom. Usually a square or swallow tail. Australian models by Peter Townend at Gordon and Smith Surfboards and Terry Richardson at Skipp Surfboards. Bonzer bottom revived in 1995. Full back cover on Rip Curl with a shot of their old bakehouse premises and the start of the build of the new headquarters. 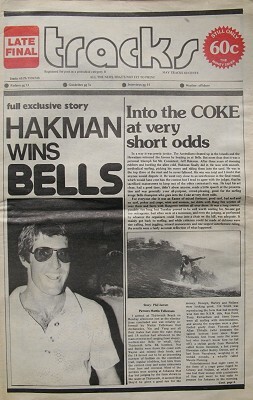 Michael Petersen interview, following wins at Bells, Coke and the Australian Titles. 2SM Coca Cola Pro, won by Michael Petersen. Australian Nationals - includes Mark Warren, Simon Anderson, Peter Townend, MP, Mark Richards, Peter McCabe, Steve Jones, Butch Cooney and, winner, Michael Petersen. Demise of Amateur World Titles? McGriggor Surfboards- "Spoon and Slab Kneeboards a Speciality of the House." Bainbridge on Speed on a Wave- actual placing of a speedo on a Trigger Bros. board-got readings of 30-35 mph. 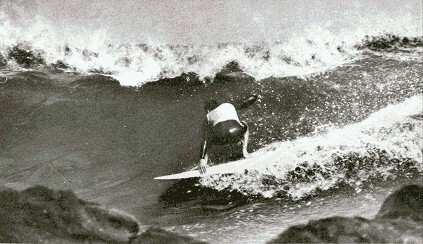 Bernie Baker, photographs: Hawaiian Winter 1974. Tinkler Tail moulded rubber and plastic add on tail with internal spring mechanism to adjust tail flex or camber, by Mike Tinkler (New Zealand?). Not popular due to weight, cost and construction difficulties. Surfworld, Torquay example by Wayne Lynch, Swallow tail, circa 1978 - loaned by Russell Graham. 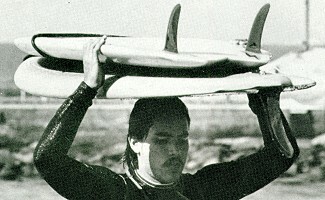 "Bob Tinkler started work on perfecting flex in stand up surfboards in 1967 after living and surfing with George Greenough and Bob McTavish in Queens land Australia, And the first custom Tinkler Tail was built in a conventional surfboard design, was the concept of a customizable Tinklertail. 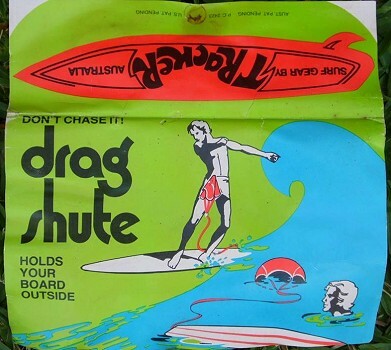 Invented by Bob Tinkler In San Diego 1969 1970 that consisted of a hollow molded surfboard with a bottom tail section embedded in the form, which acted as a resilient adjustable deflection panel. That assumes variable curves that respond to each individual surfer, based on the water pressure on the tail end of the board. With USA pat. 5425321. Sail, And Surfboards PPA. International, Pat. Pending. Contact: www. 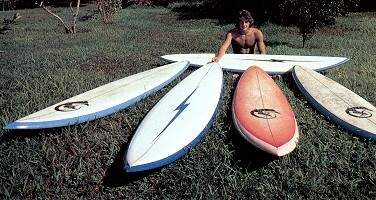 SurfSyndicate.com or emails to SurfSyndicate@msn.com"
Shaun Tomson Quiver, Hawaii, 1975. Volume 20 Number 3 page 111. Interview: Guy Ormerod and Chip Greenfield. 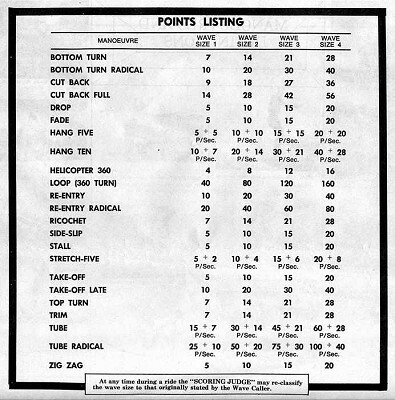 Right: Points Allocation for Bells Beach Contest, Easter 1975. Note points for Hang-five, Hang-ten, and Stretch-five. Interview: Keith Paull, 4 pages. Star signs of leading surfers. Film reviews: Tales From The Tube, Hot Lips & Inner Tubes. Interview: Wayne Lynch (4 pages). Bells- 1st Michael Peterson, 2nd Shaun Tomson, 3rd Mark Warren, 4th Jeff Hakman, 5th Mark Richards , 6th Wayne Lynch, 7th Peter Townend, 8th Midget Farrelly. Tony Wright: Seven Years on the Road. Design- Terry Fitzgerald - seven boards. 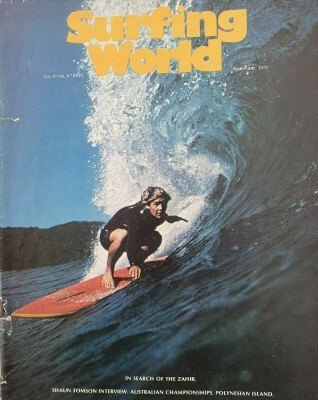 Contests: Coke Surfabout (16-page liftout), 1st Wayne Lynch, 2nd Mark Richards. Cover: The Michael Peterson Interview, 4-pages. Design: Bottoms by Simon Anderson. Adventures of Nemo & El Gato. Tahiti, sharks, books, skateboards and surf films. Peter Drouyn Surfboards, Surfers Paradise. Contests: Newcastle, won by Michael Peterson. Original design by Ben Apia (Hawaii) featuring flyers 2/3rds back from the nose (see 422) combined with a stepped bottom (see Hydroplane). 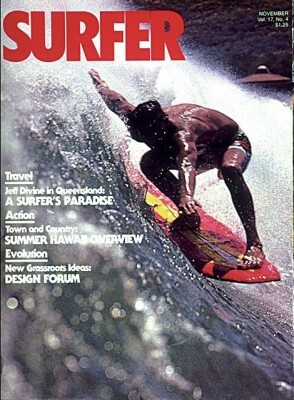 Popular design in 1976 as surfed by Mark Richards and Larry Bertelman (Hawaii). Widely copied, but most models did not incorporate the initial design’s stepped bottom. Roto-moulded Plastic boards, 6 ft 4" rounded pin surfboard design by Simon Anderson (Power Board?) and Slab kneeboard by Peter Crawford. Production possibly by Shane Surfboards. First ever rankings by the Australian Professional Surfers Association. Ski Tail distinctive tail shape based on exaggerated flyer principle, by Rod Ball at Clear Sea Surfboards and Terry Fitzgerald at Hot Buttered Surfboards. Surf board and leg rope report / Department of Culture, Sport and Recreation, Sport and Recreation Service. Publisher: [Sydney] : The Dept., 1975. Description: [49 p.] ; 33 cm. A report upon the effects of surfboard leg ropes, the sharpness and dimension of surf board fins, rails, noses and tails. Sport and Recreation Service of New South Wales. Interviews: Michael Peterson, Keith Paull, Rabbit Bartholomew, Ted Spencer, Nat Young, Wayne Lynch, Chip Greenfield, Guy Omerod, Rory Russel, Terry Fitzgerald. Contests: Smirnoff (Hawaii,) and Hang Ten Pro (Hawaii), Surfabout ’75, Bells Beach. Interviews- Bobby Owens (Hawaii), Maurie Fleming, Paul Neilsen. Levi's King Cord, with King Kong modelling the jeans. The Best of Tracks Volume 2 . 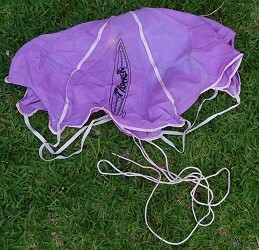 The Tracker Drag Shute, parachute legrope. Golden Breed Surf Movie Guide- The Traveling Surfing Picture Show, with Super Sessions, A Sea for Yourself, Going Surfin', Forgotten Island of Santosha, Island Magic, Tales from the Tube, 5 Summer Stories,The Cosmic Children, Hot Lips and Inner Tubes, and Zephyr by (Yuri Farrant). New product review by Craig Leggat. Tracks #68, May 1976, page 31. Fish continuation of Steve Lis (USA), design adapted by Reno Abelleira (Hawaii) as a small wave design specifically for the pro contest circuit. Further developed by Mark Richards for the Twin fin 2. 2SM / Coke Surfabout, 1976. Channel Bottom design by Jim Pollard based on Groove Ridge Theory by Jim Richardson and Art Shafer (both USA) circa 1975. Originally (4 or 6) shallow and narrow concave lines in the bottom of a board followed the rail outline and ran almost the full length of the board. 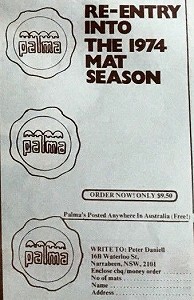 Later designs exited at flyers and by 1980’s had standardised as straight ridges parralell to the stringer. Contest success by Col Smith (Newcastle).
" Blacks Reef is the local, kamikazi spot with the reef only slightly below the surface. Pulling in the swell, this shallowness provides insane vertical takeoff and a nice wall to boot. Bonus excitement for the small group of spectators siting on the knobbly little headland. Kanga Cairns senses that the waves suit his full-on, no-holds-barred approach and insists that if he doesn't wear a legrope, no-one else should either. Terry Fitz and Kanga, being the only two naturauls in the final, are getting the lion's share of the inside waves. Terry Richo and Colin Smith are both eating it horribly, trying to negotiate the shallow ledge. Wayne Lynch finds the tube a few times with incredible timing. Rory Rusell knows what the judges are after , so he goes for the tube switchfoot, time after time, and makes it. Then minutes from the the finishing hooter, Fitz looks in a winning position, that is 'til he decides to bodysurf after a fall rather than grab his board. This decision probably cost him the final. On the wave behind, Cairns drops in vertically, disappears into the tube for seconds and reappears, soul arching to victory. " This was the last Australian professional contest to ban legropes. It covers the early history right through to 1976 with a comprehensive time line and history, photos and a gallery of surfboards from the eras past to present. 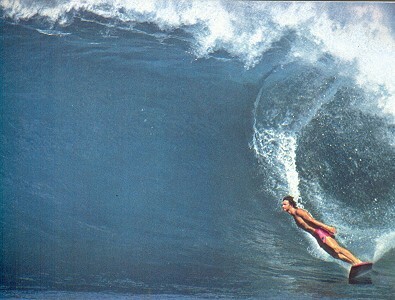 Featuring a Malibu Fin Appendix a brilliant photo of Rick Griffin. Cover feature: Photos from the tube, includes centre fold.